The crime-fighting Turtles are back and ready to fight for their city in Teenage Mutant Ninja Turtles: Earth’s Last Stand, available on DVD December 13, 2016. In this collection of seven season four episodes, the Teenage Mutant Ninja Turtles find themselves gathering the last bits of the Black Hole Generator to return to NYC and save the planet from the Triceratons. Along with old friends and new foes, the Turtles go on a wild ride to protect the city they know and love before it’s changed forever! 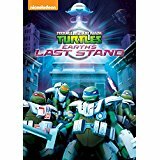 Created by Nickelodeon and distributed by Paramount Home Media Distribution, Teenage Mutant Ninja Turtles: Earth’s Last Stand will be available on DVD, along with a Raphael zipper pull as a gift with purchase while supplies last, on December 13, 2016, for the suggested retail price of $14.99. The Ever-Burning Fire - The team must overcome impossible odds to acquire the final Black Hole Generator piece. Earth’s Last Stand - As the team finally reaches Earth, Fugitoid reveals a horrible secret about his past. City at War - When April graduates to full Kunoichi, she faces a deadly new enemy while the Turtles face the return of some old, dangerous foes. Broken Foot - When Leo secretly allies himself with Karai, he gets himself into deeper danger than he could have realized. The Insecta Trifecta - The team faces Stockman-Fly’s new insect minions and Raph has to man up to overcome his fear of insects and lead the team. Mutant Gangland - Don Vizioso’s gang tracks the Turtles with a slew of Anti-Mutant weapons! Bat in the Belfry - Mikey befriends two odd new superheroes, Wingnut and Screwloose!